The collarbone connects to the sternum or breastbone in the middle of the chest at the top. 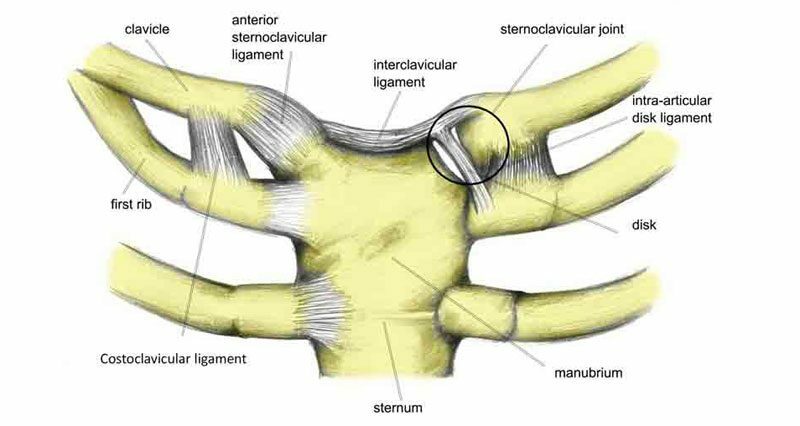 If the shoulder is subjected to a hard impact, this joint (known as the sternoclavicular joint), can become injured. There will be pain located on the joint which may spread into the shoulder. Medical help should be consulted to check there is no further damage to blood vessels in the area. Symptoms will include pain when pressing in specifically at the sternoclavicular joint where the collarbone meets the sternum. Pain may radiate into the shoulder and it is likely there will be a visible bony lump over the joint. The clavicle or collar bone connects to the sternum or breastbone in the middle of the chest at the top. If the shoulder is subjected to a hard impact this joint can become damaged. It must be said however that this is a very rare injury, but if it does occur and is quite bad you should seek medical help because the bones are dangerously close to important blood vessels. Rest. If the injury is not severe then there is little else they can do. The athlete should be able to return to sport within a few weeks but pain may still be present for a few months. A professional therapist can determine how bad the injury is and advise on when it is OK to return to sport. They may do a CT scan of the joint and if it is bad you could be confined to a hospital due to the risk of damaging blood vessels. A sternoclavicular injury will not always show up on an X-ray. An operation called a clavicle resection is a possibility. However, it is reported that few Surgeons will attempt it and it is only 50% successful.